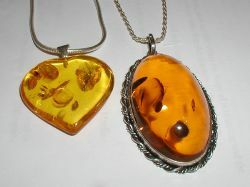 Amber pendants. The oval pendant is 52 by 32 mm (2 by 1.3 inches). Amber is the common name for fossil resin or tree sap that is appreciated for its inherent and interesting mixture of colors. Although not mineralized, it is sometimes considered and used as a gemstone. It is also widely used for the manufacture of other ornamental objects. Most of the world's amber is in the range of 30–90 million years old. Semi-fossilized resin or sub-fossil amber is called copal. Heating amber will soften it and eventually it will burn, which is why in Germanic languages the word for amber is a literal translation of Burn-Stone. (In German it is Bernstein, in Dutch it is Barnsteen.) Heated below 200°C, amber suffers decomposition, yielding an "oil of amber," and leaving a black residue known as "amber colophony," or "amber pitch"; when dissolved in oil of turpentine or in linseed oil this forms "amber varnish" or "amber lac." As mentioned above, amber was well known for its electrostatic properties since antiquity (though not identified as such until the concept of electronic charge became clear). Amber is heterogeneous in composition, but consists of several resinous bodies more or less soluble in alcohol, ether and chloroform, associated with an insoluble bituminous substance. Amber is a macromolecule by free radical polymerization of several precursors in the labdane family, communic acid, cummunol and biformene. These labdanes are diterpenes (C20H32) and trienes which means that the organic skeleton has three alkene groups available for polymerization. As amber matures over the years, more polymerization will take place as well as isomerization reactions, crosslinking and cyclization. The average composition of amber leads to the general formula C10H16O. Baltic amber or succinite (historically documented as Prussian amber) is found as irregular nodules in a marine glauconitic sand, known as blue earth, occurring in the Lower Oligocene strata of Sambia in Kaliningrad Oblast, where it is now systematically mined. It appears, however, to have been partly derived from yet earlier Tertiary deposits (Eocene); and it occurs also as a derivative mineral in later formations, such as the drift. Relics of an abundant flora occur as inclusions trapped within the amber while the resin was yet fresh, suggesting relations with the flora of Eastern Asia and the southern part of North America. Heinrich Göppert named the common amber-yielding pine of the Baltic forests Pinites succiniter, but as the wood, according to some authorities, does not seem to differ from that of the existing genus it has been also called Pinus succinifera. It is improbable, however, that the production of amber was limited to a single species; and indeed a large number of conifers belonging to different genera are represented in the amber-flora. A mosquito and a fly in this Baltic amber necklace are between 40 and 60 million years old. The resin contains, in addition to the beautifully preserved plant structures, numerous remains of insects, spiders, annelids, frogs, crustaceans and other small organisms which became enveloped while the exudation was fluid. In most cases the organic structure has disappeared, leaving only a cavity, with perhaps a trace of chitin. Even hair and feathers have occasionally been represented among the enclosures. 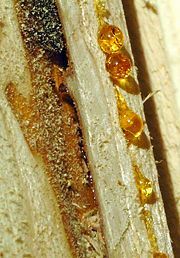 Fragments of wood frequently occur, with the tissues well-preserved by impregnation with the resin; while leaves, flowers and fruits are occasionally found in marvelous perfection. Sometimes the amber retains the form of drops and stalactites, just as it exuded from the ducts and receptacles of the injured trees. The abnormal development of resin has been called succinosis. Impurities are quite often present, especially when the resin dropped on to the ground, so that the material may be useless except for varnish-making, whence the impure amber is called firniss. Enclosures of pyrites may give a bluish color to amber. The so-called black amber is only a kind of jet. Bony amber owes its cloudy opacity to minute bubbles in the interior of the resin. A type of amber known as blue amber exists in the Dominican Republic. Dry distillation of true amber yields succinic acid, the proportion varying from about 3 percent to 8 percent, and being greatest in the pale opaque or bony varieties. The aromatic and irritating fumes emitted by burning amber are mainly due to this acid. True Baltic amber is distinguished by its yield of succinic acid, for many of the other fossil resins which are often termed amber contain either none of it, or only a very small proportion; hence the name succinite proposed by Professor James Dwight Dana, and now commonly used in scientific writings as a specific term for the real Prussian amber. Succinite has a hardness between 2 and 3, which is rather greater than that of many other fossil resins. Its specific gravity varies from 1.05 to 1.10. An effective tool for Amber analysis is IR spectroscopy. It enables the distinction between Baltic and non-Baltic amber varieties because of a specific carbonyl absorption and it can also detect the relative age of an amber sample. Wood resin, the ancient source of amber. Although amber is found along the shores of a large part of the Baltic Sea and the North Sea, the great amber-producing country is the promontory of Sambia, now part of Russia. About 90 percent of the world's extractable amber is located in the Kaliningrad region of Russia on the Baltic Sea. Pieces of amber torn from the sea-floor are cast up by the waves, and collected at ebb-tide. Sometimes the searchers wade into the sea, furnished with nets at the end of long poles, which they drag in the sea-weed containing entangled masses of amber; or they dredge from boats in shallow water and rake up amber from between the boulders. Divers have been employed to collect amber from the deeper waters. Systematic dredging on a large scale was at one time carried on in the Curonian Lagoon by Messrs Stantien and Becker, the great amber merchants of Königsberg. At the present time extensive mining operations are conducted in quest of amber. The pit amber was formerly dug in open works, but is now also worked by underground galleries. The nodules from the blue earth have to be freed from matrix and divested of their opaque crust, which can be done in revolving barrels containing sand and water. The sea-worn amber has lost its crust, but has often acquired a dull rough surface by rolling in sand. Since the establishment of the Amber Road amber (which is also commonly referred to as the "Lithuanian gold") has substantially contributed to Lithuanian economy and culture. Nowadays a great variety of amber jewelry and amberware is offered to foreign tourists in most souvenir shops as distinctive to Lithuania and its cultural heritage. The Amber Museum containing unique specimen of amber has been established in Palanga, near the sea coast. A lesser known source of amber is in the Ukraine, within a marshy forested area on the Volyhn-Polesie border. Due to the shallow depth that this amber is found at it can be extracted with the simplest of tools, and has hence led to an economy of 'amber poaching' under cover of the forest. This Ukrainian amber is much appreciated for its wide range of colors, and was used in the restoration of 'amber room' in the Empress Yekaterina's (Catherine's) palace in Pushkin, near Saint Petersburg (see below). Rolled pieces of amber, usually small but occasionally of very large size, may be picked up on the east coast of England, having probably been washed up from deposits under the North Sea. Cromer is the best-known locality, but it occurs also on other parts of the Norfolk coast, such as Great Yarmouth, as well as Southwold, Aldeburgh and Felixstowe in Suffolk, and as far south as Walton-on-the-Naze in Essex, whilst northwards it is not unknown in Yorkshire. On the other side of the North Sea, amber is found at various localities on the coast of the Netherlands and Denmark. On the shores of the Baltic it occurs not only on the German and Polish coast but in the south of Sweden, in Bornholm and other islands, and in southern Finland. Amber has indeed a very wide distribution, extending over a large part of northern Europe and occurring as far east as the Urals. Some of the amber districts of the Baltic and North Sea were known in prehistoric times, and led to early trade with the south of Europe through the Amber Road. Amber was carried to Olbia on the Black Sea, Massilia (today Marseille) on the Mediterranean, and Adria at the head of the Adriatic; and from these centers it was distributed over the Hellenic world. Amber and certain similar substances are found to a limited extent at several localities in the United States, as in the green-sand of New Jersey, but they have little or no economic value. A fluorescent amber occurs in the southern state of Chiapas in Mexico, and is used extensively to create eye-catching jewelery. Blue amber is recorded in the Dominican Republic. These Central American ambers are formed from the resins of Legume trees (Hymenea) and not conifers. The famous Vienna Amber factories, which use pale Amber to manufacture pipes and other smoking tools, apply a specific procedure when working amber. It is turned on the lathe and polished with whitening and water or with rotten stone and oil, the final luster being given by friction with flannel. During the working a significant electrostatic charge is developed. Cloudy unpolished amber, artificially illuminated. When gradually heated in an oil-bath, amber becomes soft and flexible. Two pieces of amber may be united by smearing the surfaces with linseed oil, heating them, and then pressing them together while hot. Cloudy amber may be clarified in an oil-bath, as the oil fills the numerous pores to which the turbidity is due. Small fragments, formerly thrown away or used only for varnish, are now utilized on a large scale in the formation of "ambroid" or "pressed amber." The pieces are carefully heated with exclusion of air and then compressed into a uniform mass by intense hydraulic pressure; the softened amber being forced through holes in a metal plate. The product is extensively used for the production of cheap jewelery and articles for smoking. This pressed amber yields brilliant interference colors in polarized light. Amber has often been imitated by other resins like copal and kauri, as well as by celluloid and even glass. True amber is sometimes colored artificially. Often amber (particularly with insect inclusions) is counterfeited using a plastic resin similar in appearance. A simple test (performed on the back of the object) consists of touching the object with a heated pin and determining if the resultant odor is of wood resin. If not, the object is counterfeit, although a positive test may not be conclusive owing to a thin coat of real resin. Often counterfeits will have a too perfect pose and position of the trapped insect. Unpolished amber stones, in varying hues. 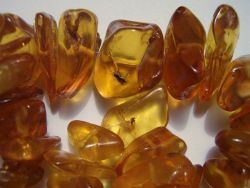 Amber is extensively used for beads and other ornaments, and for cigar-holders and the mouth-pieces of pipes. It is regarded by the Turks as specially valuable, inasmuch as it is said to be incapable of transmitting infection as the pipe passes from mouth to mouth. The variety most valued in the East is the pale straw-colored, slightly cloudy amber. Some of the best qualities are sent to Vienna for the manufacture of smoking appliances. The Amber Room was a collection of chamber wall panels commissioned in 1701 for the king of Prussia, then given to Tsar Peter the Great. The room was hidden in place from invading Nazi forces in 1941, who upon finding it in the Catherine Palace, disassembled it and moved it to Königsberg. What happened to the room beyond this point is unclear, but it may have been destroyed by bombing or when the invading Russians burned the German fortification where it was stored. It is presumed lost. It was re-created in 2003 . ↑ The Natural History of Gems or Decorative Stones. www.farlang.com. Retrieved September 20, 2007. ↑ Susie Ward AberWelcome to the World of Amber.www.emporia.edu. Retrieved September 20, 2007. ↑ Origin of word Electron.www.patent-invent.com. Retrieved September 20, 2007. ↑ Manuel Villanueva-García, Antonio Martínez-Richa, and Juvencio Robles Assignment of vibrational spectra of labdatriene derivatives and ambers: a combined experimental and density functional theoretical study.www.arkat-usa.org. Retrieved September 20, 2007. ↑ Scientist: Frog could be 25 million years old - Retrieved September 20, 2007. ↑ How Products Are Made: Amber. www.science.enotes.com. Retrieved September 20, 2007. ↑ BBC report on Amber Room, May 14, 2003.www.news.bbc.co.uk. Retrieved September 20, 2007. Hurlbut, Cornelius S., and Cornelis Klein. Manual of Mineralogy, 20th ed. New York, NY: John Wiley and Sons, 1985. ISBN 0471805807. Langenheim, Jean. Plant Resins: Chemistry, Evolution, Ecology, and Ethnobotany. Portland, OR: Timber Press Inc., 2003. ISBN 0881925748. This page was last modified on 15 March 2019, at 15:43.